With rain delaying corn planting in many areas across the province this spring the question arises as to when to switch less than full season hybrids. Following are a few factors to consider. Grain corn obtains 90 % of its total grain weight by one-halve milk line, a maturity stage that even late planted, full season hybrids reach in most years. Switching to shorter season hybrids may be a reasonable alternative from a grain yield perspective if earlier hybrids can produce yields that will yield within 10% of your full season selections. Generally this is a more favourable proposition if you are growing 3000 CHU hybrids as your full season selections, and would like to switch to hybrids that are 100-150 heat units less. The selection is quite good for elite hybrids in the upper maturity ranges within the province. If, on the other hand, your full season hybrids are in the 2650 CHU range the odds of dropping to a hybrid 100 heat units less and not giving up more than 10% yield are poor. If season ending frosts occur before late-planted corn has reached maturity (black layer) lower tests weights often result. 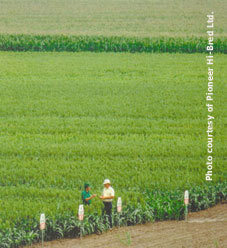 Test weight concerns need to be taken into consideration when selecting hybrids for planting in a delayed spring. Table 1 outlines potential dockage that growers may experience when delivering lower bushel weight corn to an elevator or end user. (Note: these discounts may very from elevator to elevator across the province.) Farming operations which handle and feed all of their own corn, may be unaffected by test weight concerns and choose to remain with full season hybrids longer into the planting season. Our experience from 1992 indicated that there was little or no correlation between test weight and livestock feeding value. Producers who deliver all of their corn to elevators or processors may want to switch to earlier hybrids to increase the potential for suitable test weights at harvest. Producers in shorter season areas who fear significant yield losses by switching to earlier maturing hybrids may consider staying with full season hybrids but switching to hybrids which have higher test weight scores. Table 1. Grain corn test weights and potential dockage. Full season hybrids and/or late plantings predispose the grower to higher drying costs at harvest. Any potential yield advantage that could be obtained from staying with later maturity hybrids must be weighed against additional drying costs. Table 2 outlines a study conducted by Michigan State University in the 1990's. They evaluated the yield, harvest moisture, and net returns after drying, for hybrids of different maturities across several zones within the state. Returns were calculated as bu/ac times US$2.50; less drying costs of US$ .025 per bu/ac per moisture point over 15.0%. The conclusions from this study were that although later maturing hybrids consistently out yielded earlier hybrids, drying costs generally offset any advantage in terms of net returns. corn on-farm, you may have more latitude for delaying the switch to earlier hybrids than those producers who rely on commercial drying. If your elevator charges $0.325 per bushel to dry corn from 25% to 15.5 % but charges $0.39 per bushel to dry from 30% moisture then your higher moisture corn needs to yield at least 3 bu/acre more to cover off the extra drying costs. Source: K. Dysinger, S. Canty and J. Kells. Michigan State Univ. Extension Bulletin E-431, 1998. Pioneer Hi-Bred has conducted extensive research across the northern Corn Belt into defining the optimal date were producers should switch away from full season hybrids. Some of this data is summarized in Table 3. This collection of long-term data took into account yields for hybrids of various maturity ratings as well as deductions for test weight and drying. The switch date basically implies the planting date when earlier maturing hybrids surpass full season hybrids in terms of net returns (gross returns less drying and test weight deductions). Table 3. Recommended dates to switch from full season hybrids across various heat unit zones. Source: Information adapted from, R. Iragavarapu, Basing Hybrid M aturity on L ong-term Data Pioneer Hi-Bred International Inc. In general growing hybrids with a range in maturity builds some insurance into both silking time stresses and end-of-season risks. However, making significant shifts to earlier hybrids should be reserved in the southwest (>3000 CHU) until June 1; in the mid-province corn growing areas (2700-3000 CHU) until May 25 and in the shorter season areas (< 2700 CHU) until May 20. A general rule has been to reduce hybrid maturity by 100 CHU's for every week that planting gets postponed beyond the cut-off date for full season hybrids. These are intended as general guidelines with fine-tuning for your individual farms based on the factors discussed above and upon consultation with your seed company representative.